The Swiss F/A-18 Hornet Solo Display to perform in thirteen shows in 2018. Captain Nicolas "Vincent" Rossier was confirmed as a Hornet demo pilot for the second year in a row. He is assigned to Fliegerstaffel 17 (No. 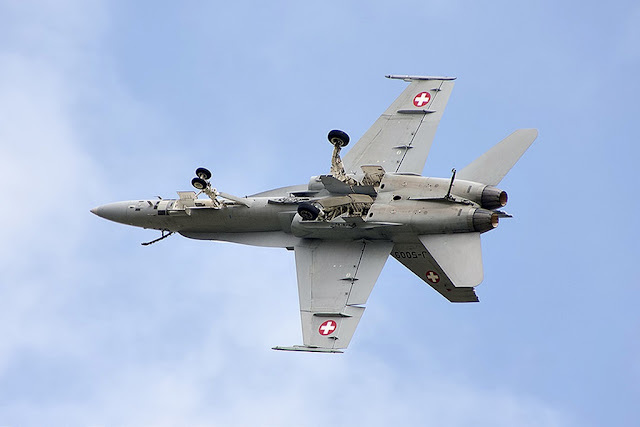 17 Squadron) based at Payerne AFB and has already logged more than 800 flight hours in the Hornet. During his career he has previously flown Pilatus PC-7, Northrop F-5E F Tiger II and the French Air Force Mirage 2000 as part of the pilot exchange program. Today he is a flight instructor in the Swiss Air Force.